Here at Wave, we’re always working on improving WaveTrackR, whether it’s updating the design or adding new features. We promote simplicity and ease with WaveTrackR and hope it gives our clients the tool they need to get the most out of their recruitment advertising. WaveTrackR’s mission is to help you smarten the way you advertise, increase applications, and stay in full control of your media advertising. We first worked on improving the design. 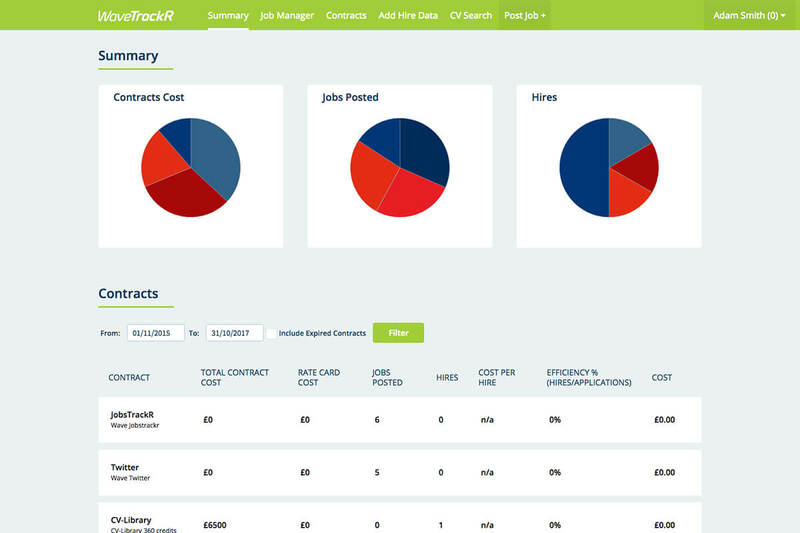 WaveTrackR was due for a refresh to reflect the software’s developing evolution as a job distribution tool. The new design of our job management software puts data first. The interface was purposely kept light and simple so all the data about your job contracts would be centre first. As an added benefit, any unnecessary embellishments were kept to the side so WaveTrackR can function faster. The new version of WaveTrackR is also fully responsive across all devices including your tablet or smartphone, so you can view all your data on the go. With this new update, we have also made significant improvements to the user journey, ensuring that you always know how to execute an action on WaveTrackR without any training. Data was always an important part of WaveTrackR, so recommendations was a natural step in the development stages of the software. With recommendations, our software suggests which job boards you should be posting on. This data is drawn from factors including sector, location, and salary information etc. Our WaveTrackR Recommends system will utilise the data we hold from previous applications and hires to provide you with updated information about which media is most likely to generate the most applications and importantly, where you’ll hire. With recommendations, you will be able to save money by only advertising on the job boards that perform best for your jobs. Our biggest new feature is CV Search. 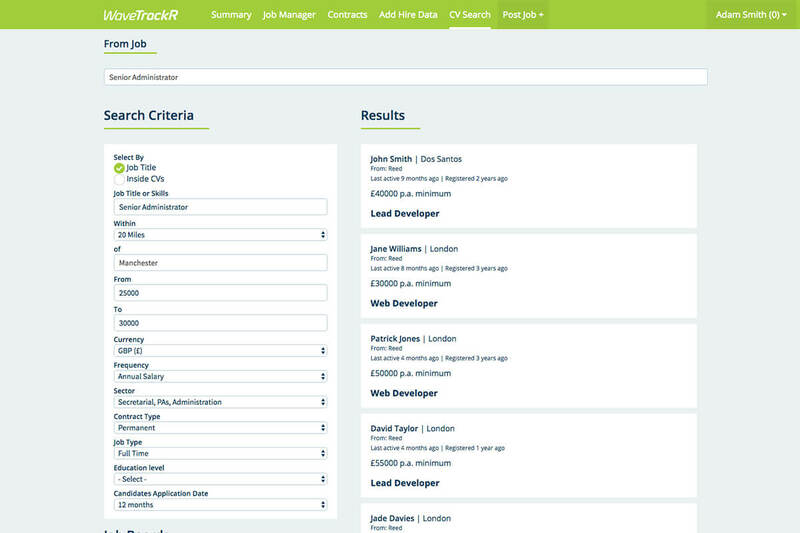 You will now be able to use your CV Databases within WaveTrackR to search for candidates. Having CV Search and your job distribution tool all in one place gives you more control and ease of access. It also saves you time and effort as you won’t need to log into more than one system, making the process easier and quicker. We aim to help make your recruitment easier and quicker by using WaveTrackR, as well as getting a better return on your investment. 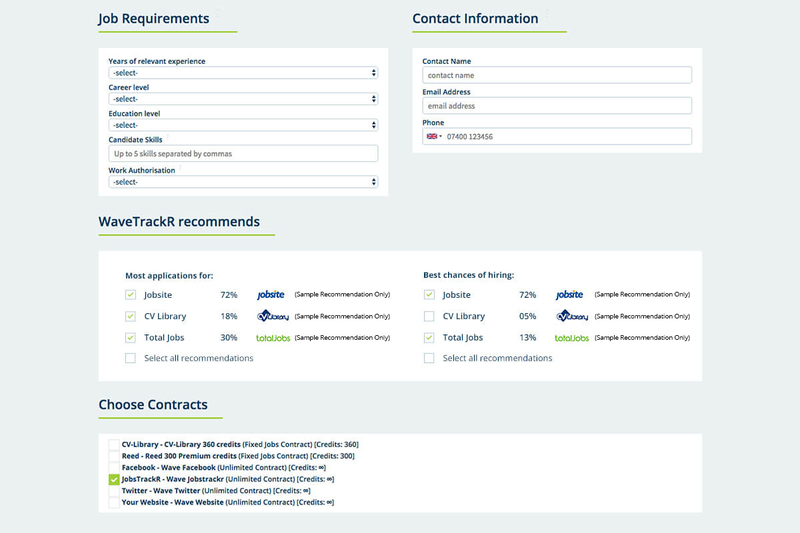 With WaveTrackR’s new release, we now offer four packages which can suit Recruitment Consultancies of all sizes. If you are interested in using WaveTrackR, please contact us for more information.